The PHS systems are modular and secure solutions for the dispatch of PINs. Künnecke offer a number of different technologies for mailing PINs. 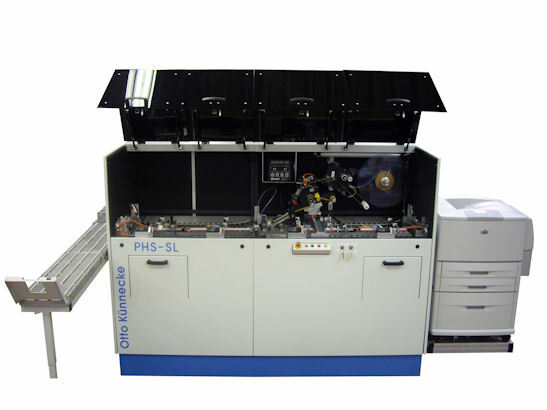 In the UK, we focus on the systems which use standard laser paper. (If you're interested in the thermoseal or pressure seal systems, please call us for further information). The secure label systems are fully modular and can be configured to suit each customer's specific security requirement. All the systems are equipped with specially-designed dark opaque covers which are electronically locked during production and therefore prevent the PINs from being seen or manipulated. The operator has no access to the PINs during machine operation. To unlock the guards and permit machine access, two operators must log onto the system with their individual passwords. The PHS-SL covers a PIN with a single label. It generally runs inline with a laser printer which personlises the carrier before a tamper-proof label is applied over the PIN. This label is checked for presence and position. The system can also be configured to feed pre-personalised sheets and inkjet a PIN inline. Using Schreiner PIN-Safe labels, this product is qualified at Level Two of the testing scheme described in UK Cards Association Standard 72.